I enjoyed the weekend so much!! The team were fantastic, the premises are wonderful and the weekend was really well thought out. My mum and I were raving about it the whole drive home. Foraging inevitably calls to mind billy cans and worm eating survival trips but it became quickly apparent that Fat Hen’s Forage and Feast weekend had nothing to do with hardship but everything to do with foodie indulgence. The ultimate recession-beating cookery course…it takes you out into the beautiful Cornish countryside and beaches, where you will pick everything from watercress and woodland mushrooms to filling baskets with seaweed. And after building up an appetite, in the evening there’s a gargantuan feast – prepared by professional chefs – in the farm’s former goat barn with performances from local folk musicians. Great, offbeat fun. I’ve gained the kind of confidence I could never have got from a book….country walks will never be the same again. The common misconception about foraged food is that it is survival grub. But an afternoon in the kitchen with Matt and Claire soon dispels this myth. A huge thank you for a truly special weekend. From the moment we arrived we felt so welcomed by the wonderful warm and friendly faces. It was so relaxing and exciting. Just a perfect Saturday although of course the weather was challenging. Such a great mix of everything. Just fantastic. The cuisine was so unique and it has given us inspiration to forage for ourselves. The photo images in the evening was a great idea re-inforcing the forage expeditions. The recipes and evening feast and entertainment and all aspects of Saturday and Sunday were perfect. What a tonic for a weary soul! Had a fabulous weekend; went away feeling inspired. All the food was wonderful, everyone helping out over the weekend really worked together to spoil us. I would love to come back at a different time of year. Thanks so much for a truly wonderful and inspiring weekend – I was expecting something pretty good but it exceeded all expectations without a doubt. A great weekend – fascinating to find and eat all these plants. Great teamwork by all of you – thanks for a wonderful time. Wow! Fantastic weekend guys! You were all so patient with me and my incessant questions, all the food was quite exceptional and has given me so much confidence to forage and cook and expand my repertoire! Thank you. A very stimulating and enjoyable weekend which has really taught me a lot and given me the inspiration to try and whole lot of new things in my cooking. A lovely relaxed and friendly atmosphere too. Thank you very much. Thank you for a great weekend, I learnt a lot. The food was surprising and full of flavours and really really good. An extraordinary foraging experience and the food!! Well, an Aladdin’s Cave of sensation. As a true city slicker I was overwhelmed with the outdoors, the diversity, Caroline’s knowledge and the fabulous food. Can’t wait to come again. A most inspiring weekend. Wonderful hospitality, incredible food, ideas for a lifetime of good cooking. Thank you so much Caroline, Matt, Lilly and oh yes, Frank. And all your helper friends. We’ll be back for a refresher. Thank you for a wonderful weekend. I’ve absolutely loved learning more about nature’s secrets and can’t wait to start utilising what I’ve learnt at home. Delicious food, great people and wonderful music – I wish you all the best for the future – I will definitely be recommending you! We really enjoyed the combination of walking and eating, foraging and demonstrations. Really lovely food, different to all other ‘foodie’ experiences. Thank you and good luck with future ventures. Very full, very happy and very keen to get foraging! Thank you for a fine repast and for all your time, energy and enthusiasm. I’ve no doubt Fat Hen will be a huge success in all the new avenues you’re exploring. Thank you for sharing your love of food and foraging – amazing!! The whole day was just perfect. We learnt just enough so as not to be overwhelmed, and the identification of what we collected was really useful.. The food that you and your two chefs cooked up have really inspired me to have a go at foraging closer to home, and to try some of the recipes. I also want to make some of your delicious crackers and the pickled crab apples that we ate with cheese for our elevenses! What a lovely location and perfect venue you and your family have created. I would thoroughly recommend your courses to anyone. Thank you so much, I look forward to trying out the recipes. A huge thank you to you and Mark for the most wonderful day. I really feel that I have gained both skills and knowledge, but above all, a great deal more confidence in working with fish. It was such a privilege to work with two such inspiring people, both sharing an obvious love and passion for fish and foraged ingredients, with mutual respect for each other. I am sure Mark’s college students appreciate how fortunate they are in having such a talented tutor. We had such a fabulous time, thank you for making it such a memorable (and delicious) weekend! We’ll definitely come to another one. 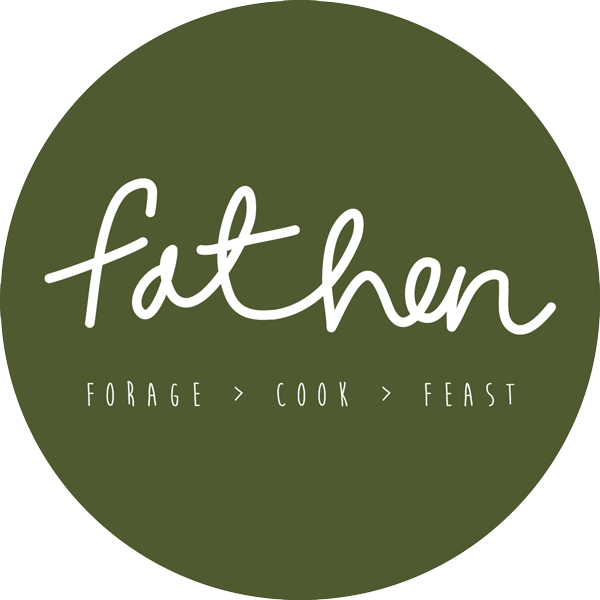 I cannot begin to tell you how much I enjoyed the three days I spent at Fat Hen last week, such revelations! You managed to make it interesting, relaxed and educational and also very tasty! I learned some useful skills for when I go wild camping, I just need a shot gun for the rabbits and a line for the mackerel! You had a fantastic team in the kitchen, so kind, helpful and fun! Thank you so much for a wonderful day today – Lance and I enjoyed every minute. It was great to meet everyone and both Rob and Sarah delighted us with their enthusiasm. It really was an exciting day! We learned such a lot and loved the relaxed atmosphere. All of the food was absolutely delicious. You all have many special talents!